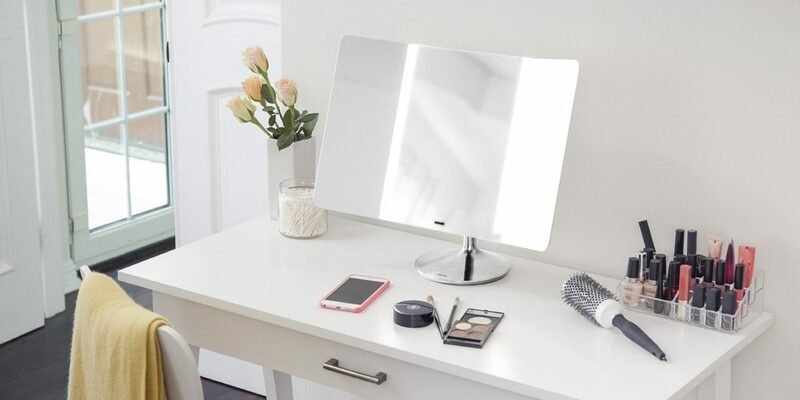 We’ve rounded up and reviewed this year’s best makeup mirrors with lights so that not only will your bedroom look good with these mirrors, but you yourself can look gorgeous taking advantage of the lights built-in into these vanity mirrors. There are quite a number of different factors that we looked into in choosing the best makeup mirror with lights which we’ve listed below. Our review in choosing the best lighted vanity mirrors boiled down to several factors but it is completely unbiased. Basically, we’ve compared some of the most popular mirrors and looked into the quality of the mirror itself, the durability of the product, the overall style and decorativeness of the mirror, the power of the lights and features of the light. Some of them are dimmer while some are more powerful. Some mirrors have wifi capabilities which you can connect to your smartphone to control the light temperature of the light bulbs which can give you more control when you’re putting on makeup. Ultimately, I think the most important decision when making a purchase is value for your money which we put a very heavy weight on choosing our recommended products. Because this review and roundup of products is specific for makeup mirrors that actually has lights then we wanted to focus on finding the mirrors that has good quality lighting. There are a couple of things to look for with regards to lighting, one is buying mirrors that are corded (plugged to an outlet). These mirrors are more powerful lights but they are less portable. The other type are the battery operated makeup mirrors and these are more portable but carry lesser powerful lights. We wanted to find the best lighted mirror that is aesthetically pleasing and more towards the modern design. The stainless steel look definitely makes for a better looking mirror compared to the plastic ones. The size also plays a good part since some mirrors can be a bit too small for usage but also some can be too huge to be aesthetically pleasing as an interior home decoration. We wanted to look for the makeup mirror that is durable for constant usage. A lot of cheap mirrors in the market look good but can be quite flimsy to use. The cheaper flimsier ones can also be a bit harder to use since they can be unstable when adjusting the angle of the mirror. We also wanted to look for mirrors that can withstand a good amount of usage from the time of purchase. This makeup mirror should just not serve as another bedroom decoration but it should be for personal use. Most importantly, we wanted to make sure that the best product that we choose has the best value for money. We did not just choose the most expensive mirror in the market and definitely did not just go for the cheapest one. We wanted to look for the cheapest lighted makeup mirror we could find that looks expensive, very durable and has the best lighting features for efficient usage. 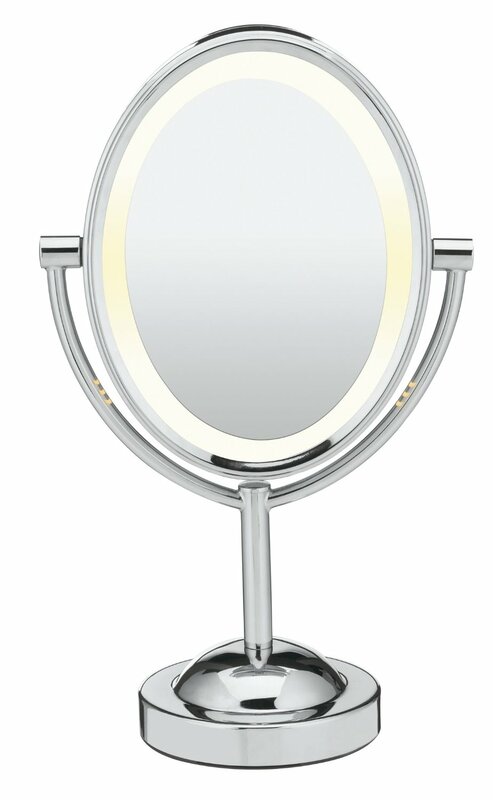 Our Pick for the Overall Best Lighted Makeup Vanity Mirror! Beautiful and elegant white minimalist design. High quality glass mirror. Uses powerful quality LED lights with 2 modes (high or low) and can be adjusted by a touch sensor button. It has automatic shut off feature to conserve energy and battery life is excellent which can last 4-5 days. The actual mirror dimension is 16.7” x 16.7” x 1.6” and weighs 4.4 lbs. It’s pretty straightforward to install and the product is sturdy and durable. Elegant and very stylish chrome finish. This double sided lighted makeup mirror is for people that is looking for excellent value for money. The mirror is high quality while the light is not as powerful as other light up makeup mirror but it’s usable for your everyday make-up and foundation. The size can be quite small as the mirror is oval in shape. This size is ideal for your bedroom or small dresser. It’s very lightweight and portable but still quite sturdy for everyday use. It’s double sided with one side having 7x magnification to focus on your facial details while the other side having a 1x magnification for your overall look. White and elegant minimalistic design. 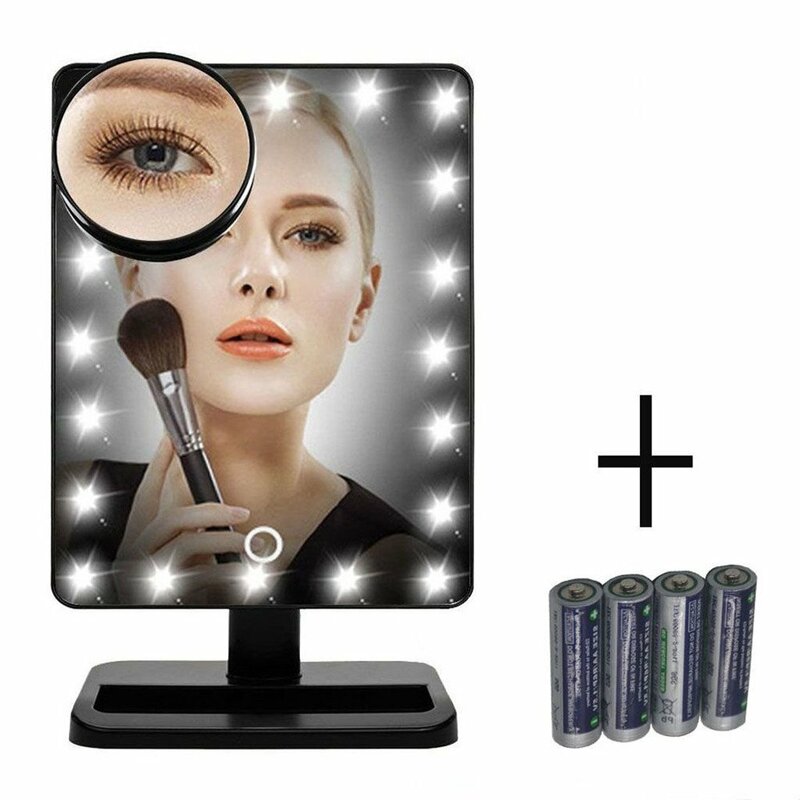 This illuminated makeup mirror is bigger than the other choices we’ve listed here for those that are looking for a larger real estate for your use. It comes with 12 dimmable LED bulbs and a table top design. 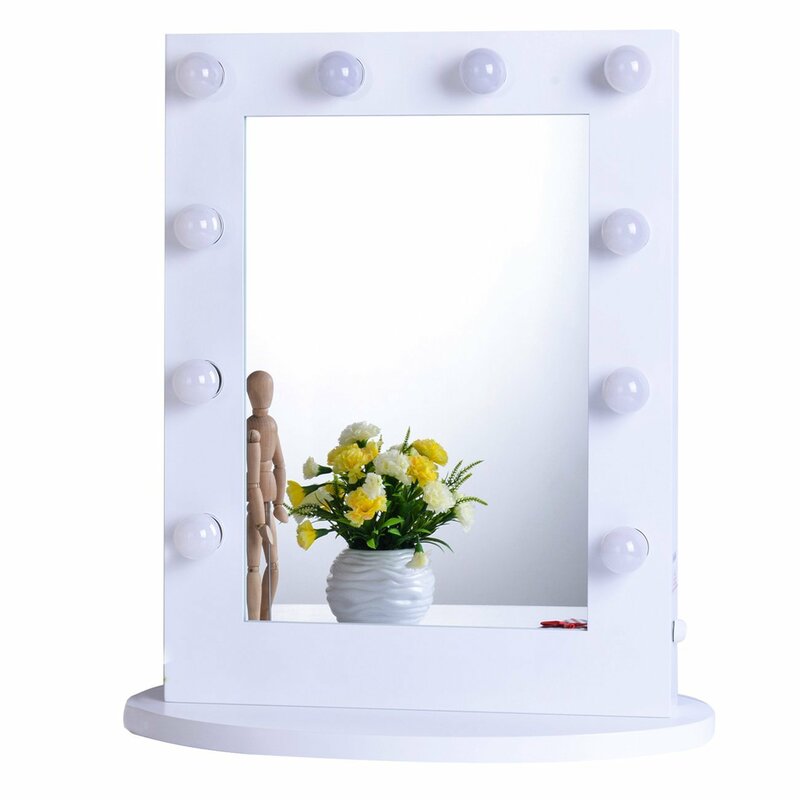 This is an excellent vanity makeup mirror with light bulbs. This makeup vanity mirror with lights sticks about 6 inches to the front and back and will not be able to be hang to the wall. This is strictly a table top mirror. The design is very traditional and comes with the frame and base. Highly recommended for those needing a contemporary makeup vanity table with lighted mirror. 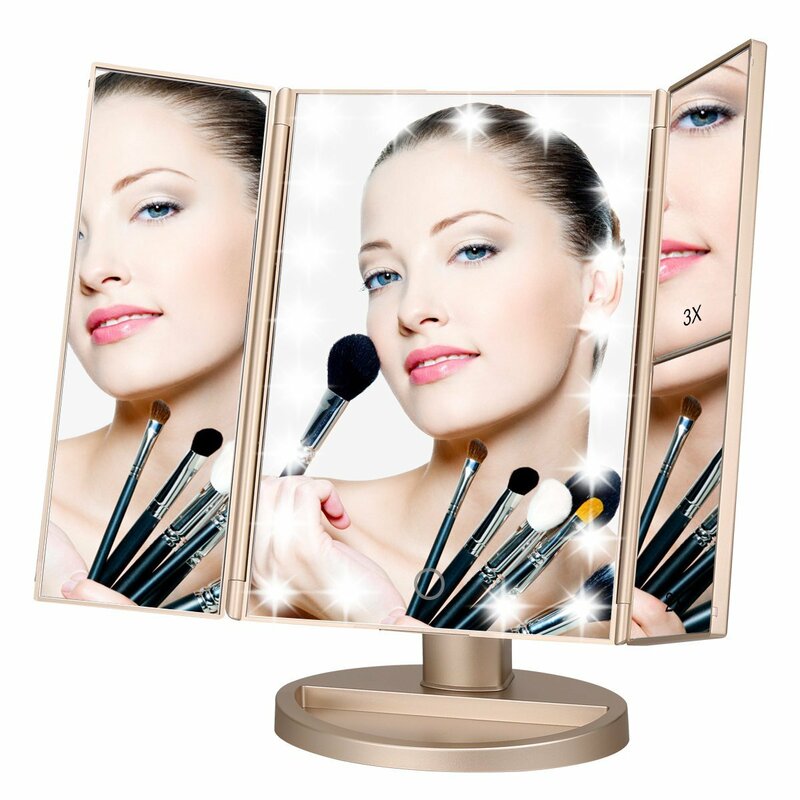 This lighted makeup mirror provides a wide angle view with it’s 3 panels and comes with 180 degree swivel rotation capabilities. The mirrors come in 3x, 2x and 1x magnification. The lighting is pretty powerful for the size and it comes both with a cable power plug and batteries so it can be pretty flexible. Comes in built in 21 pcs LED lighting and brightness is adjustable with a touch sensor switch. 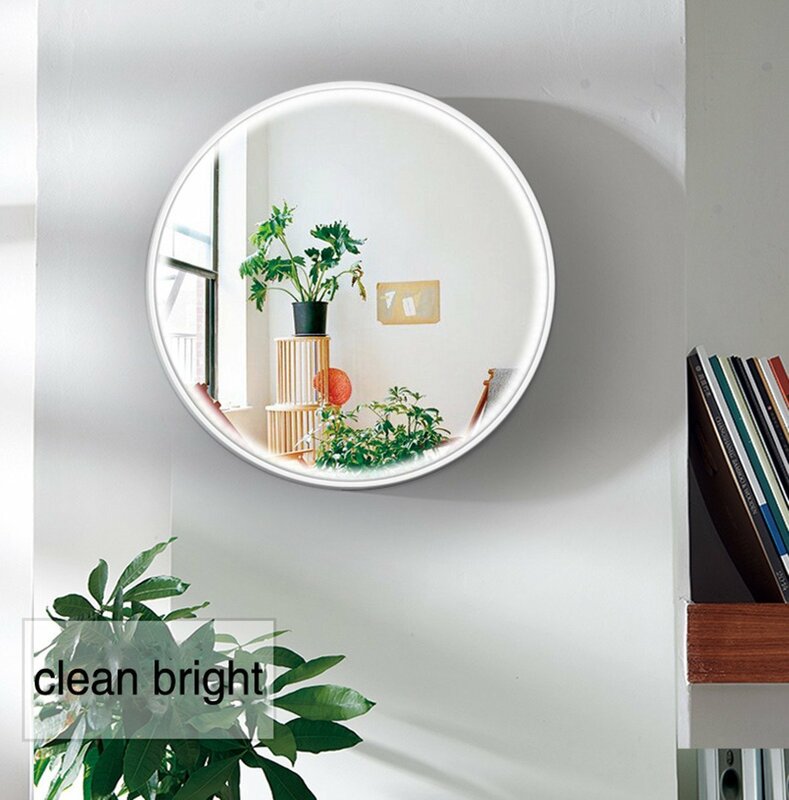 This wall mounted makeup mirror with lights from Simplehuman is very modern and stylish with a chrome finish. The lighting system simulates natural sunlight that can help you when applying makeup indoors. 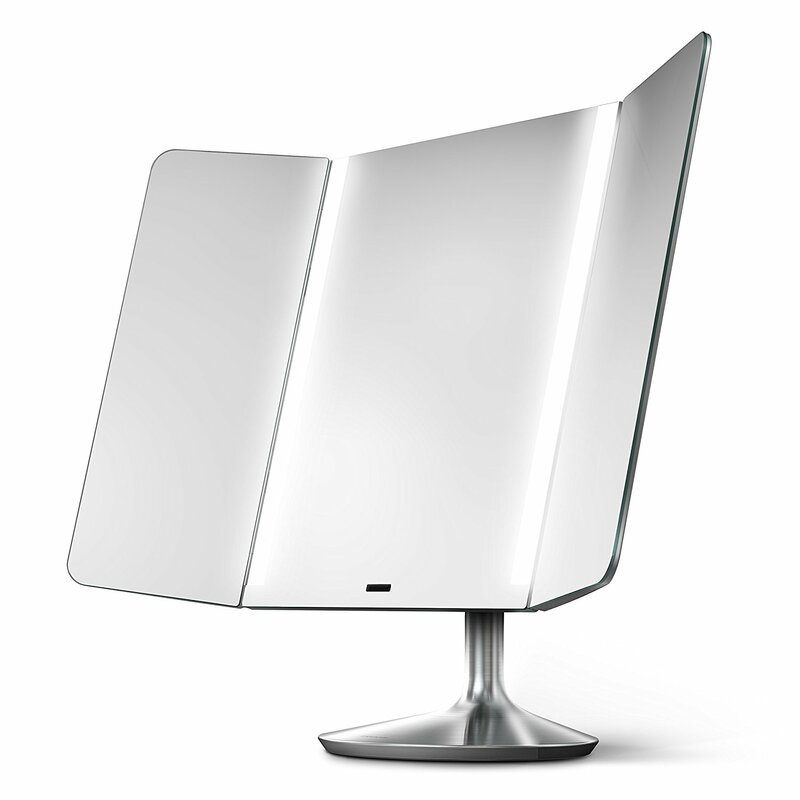 You have the option to get the rechargeable wall mounted makeup mirror or the hard-wired lighted mirror version. It has automatic sensor that knows if you’re face is near and in front of the mirror so the lights will automatically turn on or off. The mirror comes in 5x magnification. Very stylish and elegant wide view lighted vanity mirror. This is wifi enabled so you can connect to an app to adjust color temperature settings and recreate your outside lighting in the mirror. Very high quality mirror that has sensors that automatically turn on or off as your face approaches. Excellent battery life with one charge lasting up to 3 weeks! The light system simulates natural sunlight. The wide angle view mirror has 3 panels with side panels that fold in so you can adjust to see yourself in different angles. For those looking for a professional makeup mirror with lights, this is the right product for you. It’s a bit more on the luxury side because of the price but the design is very modern with excellent quality LED lights and wifi capabilities. This is a very smart lighted makeup mirror. Sleek look and classic design. This lighted makeup mirror is very portable and carries a rectangular shape which provides a wider viewing area compared to round oval shapes. Comes with 20 pcs of LED lighting with pretty powerful lighting. It’s battery operated and comes with an actual switch button at the back of the mirror apart from the touch screen button on the front. It also comes with a smaller round magnifying mirror that you can adjust and stick to the lighted makeup mirror. 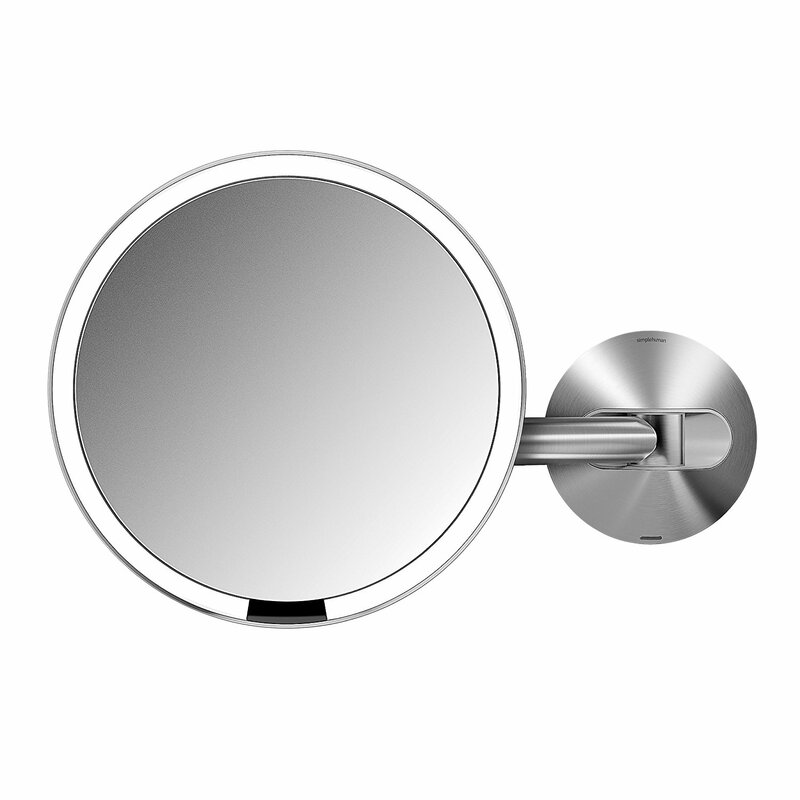 The mirror has 180 degree swivel rotation and can turn any direction both horizontal or vertical. This is a good value for money for those looking for smaller lighted makeup mirrors but don’t want the oval shaped mirrors and looking for a more traditional rectangular shaped makeup mirror.